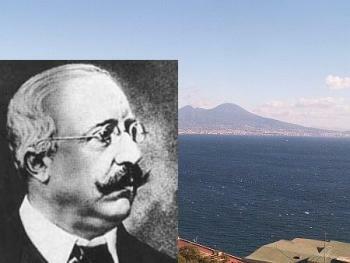 Friedrich "Fritz" Alfred Krupp (1854-1902) (photo insert), the "Cannon King" and bearer of a name tenaciously associated with German industry and militarism, was taken with Capri and is, in a sense, still present on the island in the trail that bears his name, the Via Krupp, a spectacular footpath leading down the sheer south side of the island to the sea (photo below). As for the Via Krupp (photo, right), it was closed in 1978 but as of 2009 has reopened to the public. The safety concerns were not recent. It was a difficult path to build, and there have always been problems with falling rock. Nevertheless, for over sixty years, it was kept clear by the practical expedient of a man on the end of a pulley going down the side of the cliff and knocking down dangerous bits of the cliff face before they fell. It is really a two-fold problem. One involves the safety of the trail itself. That is hard, but not that hard. They did it for decades. Two is somewhat more intricate. It is the perception that the Via Krupp is somewhat of a metaphor of not only the entire island, but of similar places that depend on a tourist economy throughout the world. Cultural historian Paul Fussel's term 'pseudo-place' comes to mind, a description of those formerly small towns and villages that today have the sole function of luring in tourists and selling them things. 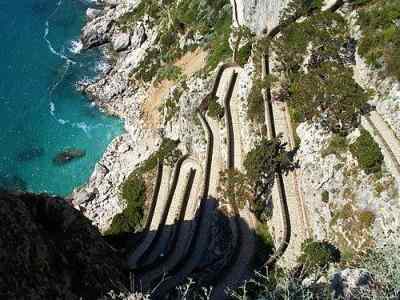 Many are worried that Capri has become —or is becoming— just such a 'pseudo-place', a process that will only be accelerated by applying concrete or building sheltered passageways along the island's most famous path. It's a hard compromise to find. Certainly, one should not fall for the myth that before the Isle of Capri was invaded by hordes of tourists, it was some idyllic gem set in the sea, a paradise for inhabitants and visitors alike. Our impression of Capri as the "Isle of Pleasure" has been formed largely by foreigners who had enough money to enjoy the island on their own terms, and who, it might be noted, were greatly resented by the local population, farmers and fishermen whose harsh lot improved only with the beginning of tourism on Capri at the turn of the 20th century. On the other hand, the Via Krupp has always been a strange combination of nature and the hand of man, somewhat like Japanese Bonsai. Maybe a bit of falling rock isn't such a bad idea.